^ Died on 16 May 1671: Dirck Christiaenszoon van Delen (or Deelen, Dalens), Dutch Baroque painter born in 1605. He studied under Frans Hals. — Dirck van Delen was mainly active in Middelburg, but also in Delft. Not in Delft Guild, but connected in style with Van Bassen. When he married in 1625 he was a citizen of Middelburg, but he settled in nearby Arnemuiden, where he became master of the toll-house. From 1628 until his death he was almost continually a member of the town council, mostly as burgomaster. He was widowed three times and had at least one son, though no children survived him. The inventory of his estate testifies that he was well-to-do. He painted architectural pieces such as grand palatial halls with court officers. He is known to have made five large canvases (most of them 3.10 meters high) for a grand house owned by Count Floris II van Pallandt, at Lange Vijverberg, The Hague. — Artist Dirck van Delen was born in Heusden, near Den Bosch. In 1625 he married in Middelburg and settled in nearby Arnemuiden. From 1628 until his death in 1671 he was a member of the town council, often also serving as burgomaster. Van Delen had an unhappy private life: three successive marriages ended with the death of his spouse. In his paintings, Van Delen focused entirely on architectural themes: originally depicting Renaissance palaces, later adding gothic church interiors. He copied the figures in these architectural works from paintings by the artist Dirck Hals of Haarlem. 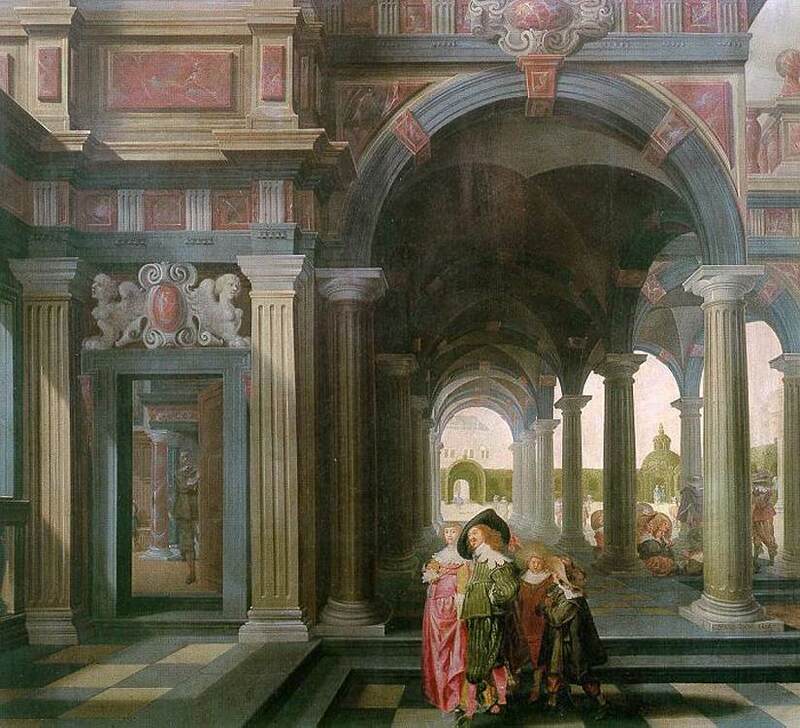 Van Delen's paintings were a major inspiration to the younger generation of architectural artists from Antwerp.  The Great Hall of the Binnenhof, The Hague, during the Great Assembly of the States General in 1651 (1651, 52x66cm) _ In 1651 the full States General met from January to August to debate the constitutional situation within the Republic. This was necessary following the sudden death (from smallpox) of Stadholder Prince William II [27 May 1626 – 06 Nov 1650]. This extraordinary assembly took place in the Great Hall of the Binnenhof in The Hague, the former court of the counts of Holland, built in the thirteenth century. Its present name, 'Ridderzaal' or Knight's Hall, is nineteenth-century. For this gathering of more than three hundred delegates the Great Hall was specially arranged. The shops and stalls along the walls were removed. Benches for the delegates were fixed down the sides of the hall. Opposite the hearth, a table was placed for the presiding officials. The table in the foreground, with the inkstand and pens, books and hourglass, may be the actual table. The tablecloth bears the arms and the motto of the Republic: CONCORDIA RES PARVAE CRESCUNT. A copper plate is attached to the painting with hinges. When the flap is opened, the assembly is obscured from view by a wall of paintings. The banners in the hall were not hung specially for the assembly. Most had hung there for more than fifty years. These were the banners Prince Maurice had captured from the Spaniards at the battles of Turnhout (1597) and Nieuwpoort (1600). It was suggested that the banners and other trophies be removed for the duration of the sitting: after all, peace had been signed with Spain only three years before. But the opposite happened. The existing trophies were dusted and others were added: Spanish and Portuguese naval flags, recognisable from the crowned coats of arms. They had been captured at the battles of Gibraltar (1607) and The Downs (1639). The States General had met once before in the Great Hall, in 1581. A major issue had been at stake then as well: the abjuration of the authority of Philip II [21 May 1527 – 13 Sep 1598] of Spain as sovereign of the Netherlands. This time the position of the stadholder was the issue. The province of Holland, having recently experienced a series of major conflicts with William II, opposed the appointment of a successor. Holland won the day. The States General ruled that a province did not necessarily need to appoint a stadholder. No successor to William II was named. Friesland and Groningen kept their own stadholder: Count William Frederick [1613-1664], a cousin of William II.  Conversation outside a Castle (1636) _ Dirck van Delen, sometime municipal official and burgomaster of Arnemuiden, painted church interiors and Renaissance palaces in the Vredeman de Vries and Steenwijck style. 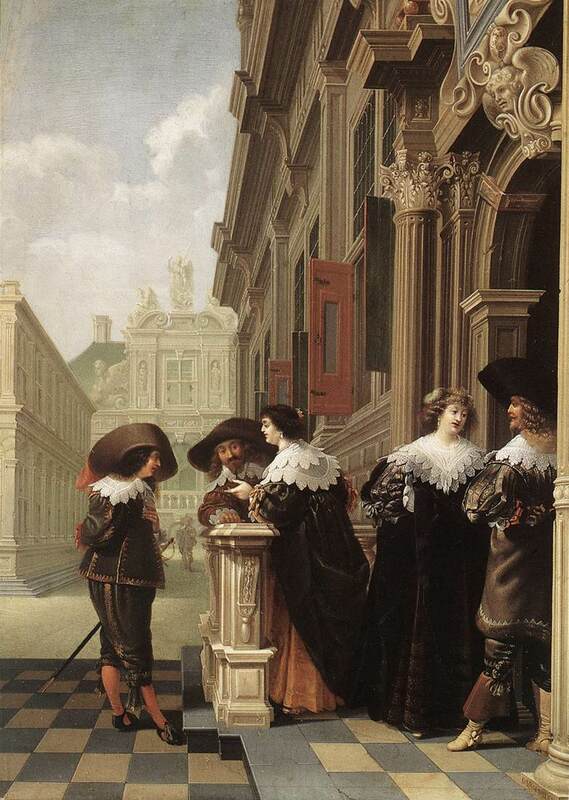  Palace Courtyard with Figures (1635; 637x700pix, 109kb) _ The Dutch painter Hans Vredeman de Vries, shortly before he died in 1604, published a book with engraved perspective innovations. This book, which was extremely important in transmitting the extensive Italian knowledge about perspective and architectural ornamention to the north, influenced Dirck van Deelen. 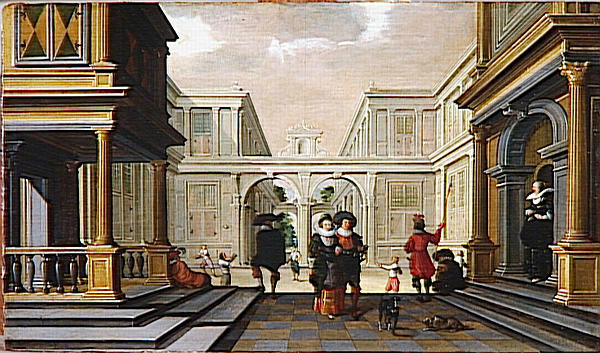 This painting shows the dominant style of architectural painting which van Delen followed all his life. — Salomon et la Reine de Saba (1638, 100x155cm) _ similar to the 1633 version auctioned at Christie's in 1963.  Cotman was born in the parish of Saint Mary Coslany, Norwich, the son of Edmund Cotman, a hairdresser, later a haberdasher [but never a maker or seller of cots], and Ann Sell. In 1793 he entered Norwich Grammar School as a �freeplacer�. In 1798 he moved to London, where he worked as an assistant to the publisher Rudolph Ackermann. Following in the footsteps of Turner and Thomas Girtin he joined Dr Monro�s �Academy� in 1799 and became a member of the sketching society that had developed around the personality and talent of Girtin. He exhibited at the Royal Academy for the first time in 1800, when he was awarded the large silver palette by the Society of Arts. 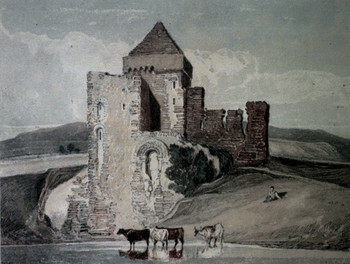 — Cotman has been considered the best watercolorist of his generation. Although his career was not cut short like so many of the famous Romantics -- Keats, Girtin, Schubert -- it was curiously aborted; his best work was done in the first decade of the century when, under the influence of Girtin, he produced a remarkable series of watercolors characterized by firm drawing, delicate washes, and an uncanny sense of design. Atmosphere doesn't play a strong role in Cotman's work; light does. Cotman had a unique ability to give masses and shadows a kind of equivalence in the design which in some respects prefigures Cubism, a full century in the future. In his latter years, Cotman was troubled by fits of depression and this, combined with relative isolation in Norfolk (he was one of the founders of the "Norwich School") led him away from his genius to pursue the influence of Turner and what Ruskin came to call "The Turnerian sublime." Cotman died in London. — Among Cotman's students were George Devey, Dawson Turner, and William Burges, who also did his early work in Cotman's studio. — A Ruined House (600x472pix, 69kb) _ “After the Earthquake”? ^ Died on 16 May 1669: Pietro Berrettini I da Cortona, Italian Baroque era painter, draftsman, and architect, probably born on 01 November 1596 (baptized on 27 November 1597). — He was, together with Gianlorenzo Bernini and Franceso Borromini, one of the three leading artists of the Roman Baroque. As a painter he developed the early Baroque style, initiated by Annibale Carracci, to a magnificent and imposing High Baroque. His fresco decorations set a standard for European Baroque painting until they were eclipsed by Giambattista Tiepolo�s works and those of other Venetian masters of the 18th century. As an architect Cortona was far less influential. His imaginative designs for fa�ades and stucco decorations were, however, conclusive and independent solutions to problems central to Roman Baroque architecture. — Pietro Berrettini da Cortona was one of the founders of the Roman High Baroque, comparable with Bernini in sculpture. His first works were painted for the Sacchetti family, but he was soon taken up by the powerful Barberini family — the family of Urban VIII — for whom he painted frescoes in Sta Bibiana, Rome (1624-1626), followed by his greatest work, the ceiling in the Barberini Palace. This is a huge fresco representing an Allegory of Divine Providence and Barberini Power, begun in 1633 and completed in 1639; a sketch for it is now exhibited with it, but its authenticity is open to doubt. The fresco is a huge illusion, like the ceilings of Lanfranco [1582-1647] or Gurcino, with the central field apparently open to the sky and scores of figures seen 'al di Sotto in Su' apparently coming into the room itself or floating above it. While working on this, Pietro also went to Florence and began a series of similar frescoes in the Pitti Palace; he also began a series of frescoes in the Chiesa Nuova, Rome, which was not finished until 1665. Towards the end of his life he devoted much of his time to architecture, but he published a treatise on painting in 1652 under a pseudonym and in collaboration. He refused invitations to both France and Spain. With the help of numerous students, of whom Ciro Ferri was the most important, he painted many other frescoes and easel pictures in Rome and Florence. — Berrettini's assistants included Giovanni Francesco Romanelli, Francesco Allegrini, Giovanni Maria Bottalla, Andrea Camassei, Guglielmo Cortese, Vincenzo Dandini [1609-1675], Giacinto Gimignani [bap.23 Jan 1606 – 09 Dec 1681], Filippo Lauri, Livio Mehus, Pietro Testa, Raffaele Vanni. — The Punishment of Hercules (1635, 300x200cm; 625x440pix, 94kb _ ZOOM to 1251x880pix, 368kb _ ZOOM+ to 2500x1759pix, 1502kb _ ZOOM++ to 5000x3518pix, 4625kb) _ Hercules is in the pose of the Apollo Belvedere. This seated Hellenic figure of a muscular naked man, with its anatomically precise delineation of the limbs, its harmonious proportions and complicated shift of the body axis, became a much-studied and varied motif in both painting and sculpture. The sweeping, tense pose accorded with Baroque design principles. In Cortona�s case, it was well suited to illustrating the difficult and conflicting situation in which Hercules is presented here. According to Ovid, as punishment for a murder he had committed, Hercules was bound to serve Queen Omphale for a year, wearing women�s clothes and doing women�s work. The moment when the ancient hero is disarmed is shown here: putti rob him of his lion-skin and club, and equip him with a distaff and a red dress with a costly girdle. Another putto touches the humiliated hero with the weakening arrow of love. Cortona�s practice in handling the monumental dimensions of frescoes shows in the completely natural way the figure of Hercules dominates the painting. His expression is one of effortless power, achieved in particular through the skilful modelling of the torso with the light striking it from the side. The strong, bright colors correspond to the even distribution of light in the painting. — Cardinal Pietro Maria Borghese (1642, 53x39 in; 400x290pix, 24kb _ ZOOM to 1000x725pix, 570kb _ ZOOM+ to 2376x1723pix, 2706kb) _ Pietro (or Pier) Maria Borghese [1599 – 16 Jun 1642] was made a cardinal by Pope Urban VIII [bap. 05 Apr 1568 � 29 Jul 1644] on 07 October 1624. 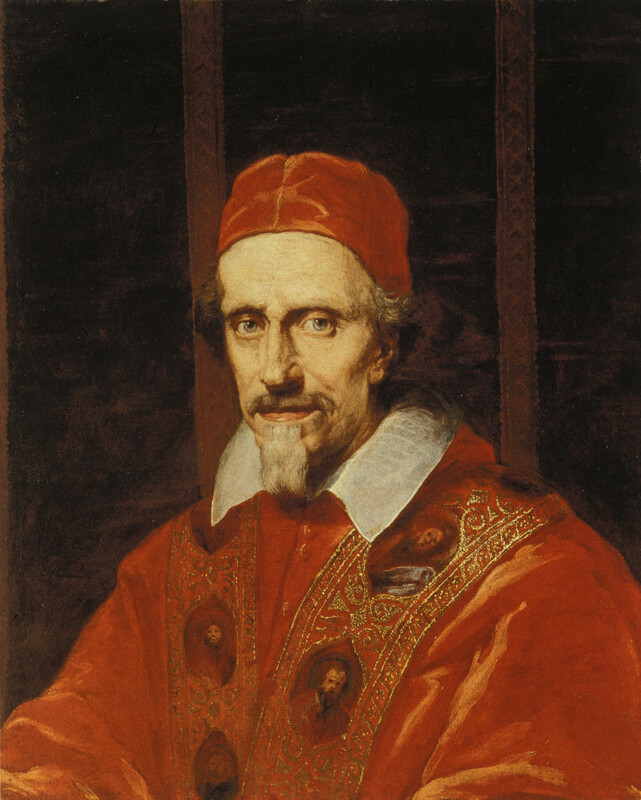 Urban VIII (Maffeo Barberini) had been made a cardinal on 11 September 1606 by Pope Paul V (Camillo Borghese) [17 Sep 1552 – 28 Jan 1621], a relative of Pietro M. Borghese. 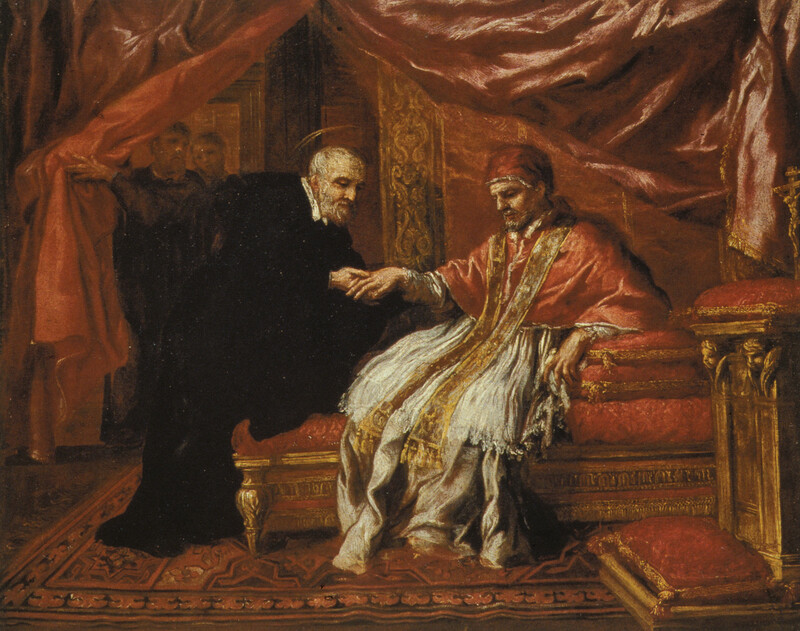 — Il papa Clemente IX Rospigliosi (1669; 600x481pix _ ZOOM to 1400x1121pix) _ Giulio Rospigliosi [28 Jan 1600 – 09 Dec 1669] was elected Pope Clement IX on 20 June 1667. — San Filippo Neri guarisce dalla gotta Clemente VIII (1646; 600x760pix _ ZOOM to 1400x1774pix) _ Filippo Neri [21 Jul 1515 – 26 May 1595] was canonized in 1622. 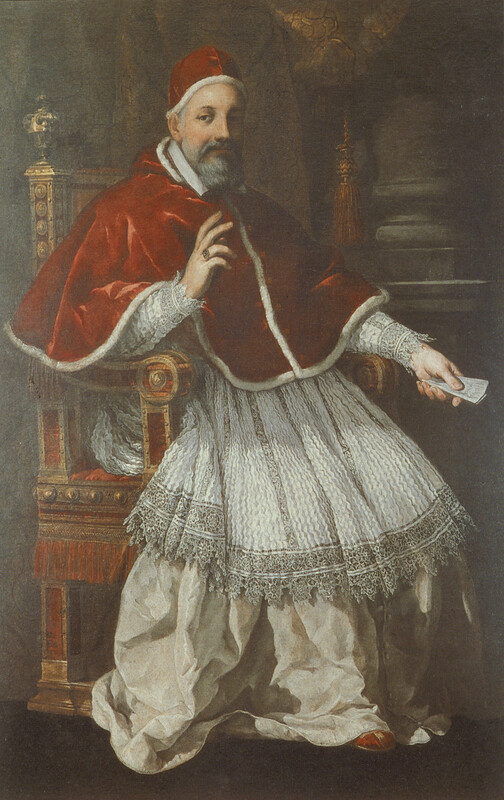 Prior to the 30 January 1592 election of Ippolito Aldobrandini [March 1536 – 05 March 1605] as Pope Clement VIII (who suffered greatly from the gout), Filippo Neri was for thirty years his confessor. — The Triumph of Divine Providence (1639) _ In 1625 the Barberini family purchased the Palazzo Sforza and other properties in the area which was to be incorporated to the Barberini palace we see today in Rome. Upon the death of Carlo Maderno, the first architect of the project, Gian Lorenzo Bernini succeeded as chief architect in 1629. Bernini's is the conception of the high central "salone', which extends through two stories of the palace. The salone culminates in the great vault on which Piero da Cortona frescoed his Divine Providence, a pictorial celebration of the spiritual and temporal glories of the Barberini. Cortona also had a hand in the building of the palace complex: the largest of his contributions was the design of the theater wing, demolished in 1926 with the opening of the modern Via Barberini. _ detail _ This ceiling in the reception room at Palazzo Barberini was the most important single work that helped to make the Baroque the dominant style in Rome, and so over much of Europe, during the seventeenth century. The orderly clarity of Annibale Carracci's frescos in Palazzo Farnese was replaced by a turbulent composition that was full of spiraling movement. 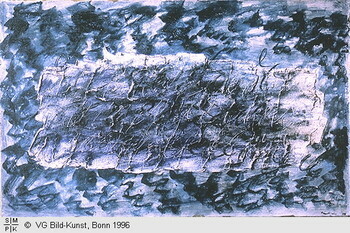 Everything combines to underline the vibrant dynamism of the work. The large scudding clouds and the perspective viewpoints looking up from below were probably inspired by Correggio's examples. But the brand new ingredient was Pietro da Cortona's desire to turn the fresco into a total work of art. The spectator was intended to lose his perception of space when he looked at it and become caught up in a spiritual and esthetic ecstasy. Another hallmark of Baroque was the happy way it mixed different subjects. In this scene, officially on a religious theme, the triumphs of the Barberini dynasty are nearly as apparent as those of Divine Providence as can be seen from the way their heraldic device of flying bees dominates the scene. — View of the Galleria Pamphili (1654) _ Landing of the Trojans at the Mouth of Tiberis (1654) _ Apotheose of Aeneas (detail) (1654, 908x580pix, 127kb) _ Pope Innocent X (from the rich Pamphili family) decided to erect the family palace at the Piazza Navona in Rome. It was built by Girolamo Rainaldi in Baroque style. The Galleria in the palace was decorated by Pietro da Cortona. The subjects of the ceiling frescoes are related to the story of Aeneas, a Trojan prince who escaped by sea with a band of companions after the sack of Troy by the Greeks. After many adventures they reached Latium in Italy where they settled. They were the legendary ancestors of the Roman people. — The Guardian Angel (1656, 225x143cm, 694x1100pix, 101kb) _ It was attributed to Romanelli until the WWII. It was commissioned by Pope Alexander VII, along with a pendant of Saint Michael the Archangel. The Guardian Angel was copied by both Gaulli and Maratta. — Holy Family Resting on the Flight to Egypt (1643, 48x39cm, 666x857pix, 106kb) _ This painting of the Madonna may be regarded as the very epitome of a Baroque devotional picture. It shows the Holy Family resting on the flight to Egypt. Joseph is approaching in the background, while in the foreground an angel is offering fruit to refresh the child. Yet the expression "devotional picture" should be used with caution, for the question of specific types in this genre is still the subject of lively debate and much research remains to be conducted into the eras after the Middle Ages. Nevertheless, even at first glance, it is clear that the intimacy of Cortona's Madonna painting has more than just an aesthetic intention; it is meant to influence the mood of the spectator in a manner conducive to private prayer. 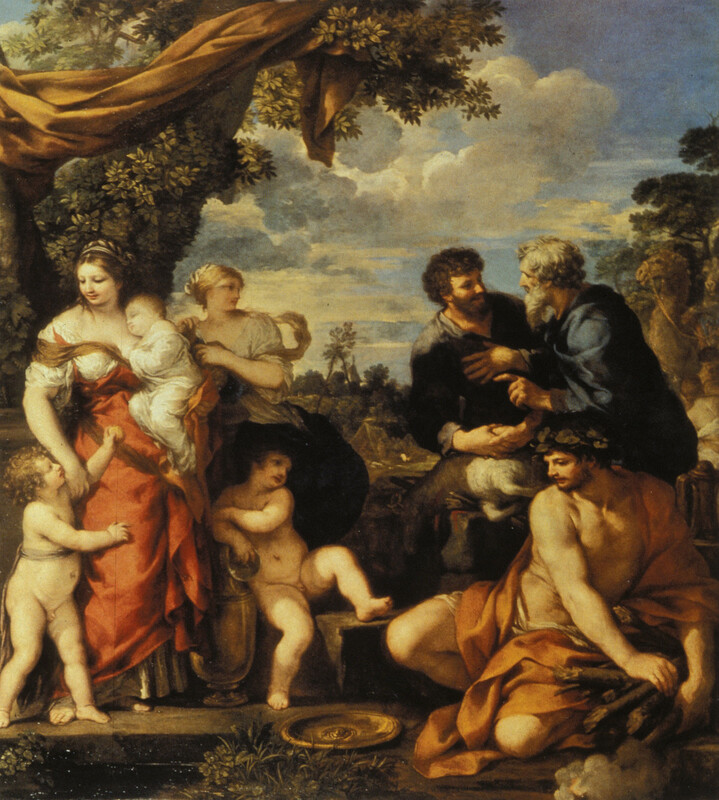 The question of the devotional picture is somewhat complicated by Cortona's use of elements taken from the pagan vocabulary of early Roman Baroque — the idyllic, the pastoral, the antique bucolic landscape with its shady trees and wild wine — in keeping with the increasingly aesthetic interests of buyers. Cortona's powers of synthesis are evident in the way he applies them successfully to create an ecclesiastical image of great atmosphere. 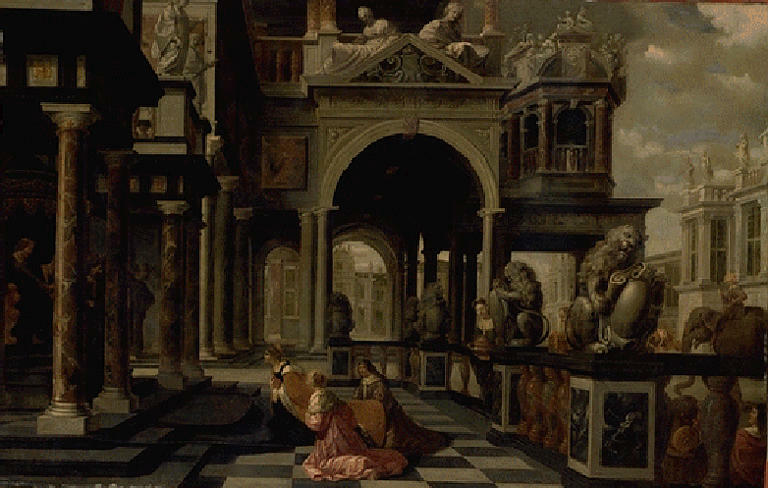 — Piet� (1625, 750x1190pix, 107kb) _ This early painting was rediscovered almost by chance in 1983. It had been inexplicably lost for over three and a half centuries in the painter's home town and provides remarkable proof of Pietro da Cortona's early and versatile talent. It also reveals his Tuscan heritage as well as his taste for embellishing his paintings with billowing drapes and glimpses of landscape. — The Abduction of the Sabine Women (1629, 280x426cm, 1207x802pix, 182kb) _ The Sacchetti family commissioned this painting in the 1620s when Pietro da Cortona was just making his name in Roman circles. They thus became his first patrons and introduced him to the world of aristocratic commissions. During the first two decades of the century, Caravaggio's naturalistic style had been rivaled by the Carracci cousins' academic style of classicism. Each school had its own followers and some attempts had been made to bring the two together. The arrival of Pietro da Cortona, at the same time as Bernini erupted onto the scene as the preferred sculptor and architect of the Barberini pope Urban VIII, were together sufficient to transform art in Rome and to create a true Baroque style. Pietro da Cortona's painting stands out for its open theatricality, lively gestures, richness of color, and brushwork, as well as its diffused light. The Sabine women being lifted into the air deliberately derive from Bernini's works, such as Apollo and Daphne, as if to underline the bond between the two artists. There is little real violence in his treatment of this scene from Roman legend, merely a splendidly theatrical display of half-clothed bodies. _ See comments on the painting on the same subject by Sebastiano Ricci. — Romulus and Remus Brought Back by Faustulus (1643, 251x266cm, 1020x966pix, 142kb) _ The twin brothers Romulus and Remus are the legendary founders of Rome. Their mother, a Vestal Virgin, explained her pregnancy by claiming she had been violated by Mars, the god of war. She was thrown into prison and the children were ordered to be drowned in the Tiber. They survived and were reared by a she-wolf, and by a woodpecker that watched over them and brought them food. They were discovered by Faustulus, the herdsman. — Marcello Sacchetti (1626, 659x931pix, 72kb) _ Pietro da Cortona's patron, the cultured Marcello Sacchetti, is shown in a spontaneous pose in front of a gilded table bearing his coat of arms. — Venus as Huntress Appears to Aeneas (137kb) _ The goddess Venus, the mother of Aeneas, appeared him twice, first in the midst of burning Troy to bid him be on his way. Later, when the Trojans were washed ashore near Carthage after the storm at sea, Aeneas and his friend Achates set out to explore. Venus appeared once more, this time with bow and quiver disguised as a huntress, to direct them to Dido's palace. The artist depicted in this picture the second appearance.  57 prints at FAMSF. ^ Born on 16 May 1893: Niles Maurice Spencer, US painter who died on 15 May 1952. — His family owned Slater Mill, which, under the ownership of Samuel Slater, had introduced a new water-powered technology to manufacturing. This helped to launch the USA into the Industrial Revolution. The Spencers prospered from manufacturing and Spencer�s humanistic handling of the subject may have resulted from growing up in this industrial milieu. An art student from the age of 16 at the Rhode Island School of Design (RISD), he studied under Charles Woodbury in Ogunquit, Maine, during the summers of 1914 and 1915 and graduated from RISD in 1915. From 1915 to 1917 he studied under Robert Henri and George Bellows at the Ferrer School in New York. He painted at Ogunquit from 1917 to 1922 and at Provincetown from 1923 to 1930. From 1931 to 1941 he produced paintings of industry and New York, before turning to a geometric abstraction (1943�1952). Throughout his career he returned to still-lifes as architectural compositions. — A Precisionist painter who was influenced by European Cubism, Niles Spencer is best known for his unembellished arrangements of architectural forms. Although he used crisply defined zones of color to depict his motifs, as did other Precisionist artists, his work is warmer in feeling and less impersonal than that of other figures in this movement, such as Charles Sheeler or Charles Demuth. Spencer was born in Pawtucket, Rhode Island, and studied at the Rhode Island School of Design in Providence and at the National Academy of Design in New York. His sources included the art of Paul Cezanne as well as American folk art and Shaker furniture. From 1913 until 1922 he was associated with the summer artists' colony in Ogunquit, Maine. He later spent summers in Provincetown, Massachusetts, and Sag Harbor, Long Island. During the 1930s Spencer concentrated on images of New York streets, architectural structures, and industry. During the next decade Spencer adopted a more abstract style than in the past; the hard-edged planes of his work at this time anticipated geometric abstract painting of the 1960s. — Niles Spencer received his formal training at the Rhode Island School of Design and in summer classes with Charles Woodbury in Ogunquit, Maine. Later he studied briefly with Kenneth Hayes Miller at the Art Students League, and with Robert Henri and George Bellows at the Ferrer School. However, the deciding influence on Spencer was a 1921 trip to Europe, where he was exposed to the work of Paul C�zanne, and the Cubism of Pablo Picasso, Georges Braque, and Juan Gris, which provided the basic vocabulary on which Spencer's uninhabited industrial landscapes are based. Primary among his US influences is Charles Sheeler, whose use of an exacting, geometric interpretation, also inspired by Cubism, is apparent even in Spencer's early work. City Walls (1921), a pivotal work in his career, shows an assimilation of Cubist principles. The typical simplification of form, flattened perspective, muted tonalities, and urban subject in City Walls were a prelude for Spencer, who would rework and explore these same elements in his art for the next thirty years. Captured with stark and elegant beauty, the reductive urban compositions of buildings, factories, and smokestacks became his signature. Along with Spencer, Charles Sheeler, Charles Demuth [1883-1935], and Preston Dickinson utilized similar elements in the formulation of a Precisionist style. — Niles Spencer was born in Pawtucket, Rhode Island, the son of Henry Lewin Spencer and Margaret Allen. The Spencer family had extensive business interests in Pawtucket including banking and manufacturing. Niles Spencer graduated from the Rhode Island School of Design in nearby Providence in 1915. He studied several summers in Ogunquit, Maine with Charles Woodbury and subsequently, with the avant garde group surrounding Hamilton Easter Field. In 1916, Spencer moved to New York to continue his studies. The lively intellectual milieu of Greenwich Village was in its heyday, and Spencer was exposed to many of the radical theoreticians and personalities of the time, who encouraged him to begin working in new directions. Deeply influenced by Cézanne's faceted explorations of landscape and still life, Spencer's paintings began to focus on the geometry of architectural shapes and how they related to their landscape. Spencer's work is often associated with a group of US classicist painters called the Precisionists, a loosely knit group including Charles Sheeler, Charles Demuth, Louis Lozowick, George Ault, Elsie Driggs and Ralston Crawford [25 Sep 1906 – 27 Apr 1978]. The Precisionists reduced the US industrial landscape to a spare dynamic, architectonic composition characterized by an unmodulated surface and simplified images. Searching for a singular modern US subject, they venerated the machine and industry as an exaltation of the dynamism of the future. During the 1920s, Spencer produced a series of paintings using the architectural landscape of Provincetown, Massachusetts, as his focus. In a typical painting, the distinctive vernacular architecture of New England is silhouetted in an atmospheric light-gray wash, characteristic of an overcast day at the water's edge. In the 1930s, Spencer turned from the light-filled landscapes of Provincetown to studies of New York City and of industry. A mural commissioned by the US Treasury Department in 1937 for a post office in Aliquippa, Pennsylvania, resulted in many drawings and oil studies and a new vocabulary of forms for Spencer. When he returned to Provincetown, his leitmotif was the railroad, construction equipment, ice plants, and other industrial subjects. Spencer's painting method was painstakingly slow. He revised and reworked his compositions until he arrived at something that satisfied him. The surfaces of his paintings are loosely brushed layers of subtle, tonal changes of color. The palimpsest of each painting--the artist's process of distillation and decision-making -- is visible through the many layers and changes of shape. His paintings are unique among the Precisionists for precisely this process and for the sophisticated tonalities of color which evoke an emotional and moody atmosphere. Spencer's career can be divided into several distinct stylistic periods: the early Ogunquit paintings (1913-1922) showing the early influence of Cézanne; the Provincetown paintings (1923-1930); the paintings of industry and New York (1931-1942) and the late geometric work (1943-1952) showing Spencer's turn toward abstraction. During this last period, shapes became more two-dimensional and stylized, and the subject less identifiable. The still-life paintings which Spencer made throughout his life reflected these different stylistic concerns. Spencer's output was relatively small, a result of his slow methodical working methods and his early death of a heart attack in Dingman's Ferry, Pennsylvania. Spencer married twice; his first marriage in 1917 to Betty Lockett ended in divorce in 1942, and in 1947 he married Catherine Brett. He had no children by either marriage. Although widely known and respected by artists and museum curators, he was often described as reticent and introspective. Unwilling or unable to promote his work in an increasingly commercial environment, Spencer was often missing from the large survey shows of the period. The tireless work of his dealer at the Downtown Gallery, Edith Halpert, helped to ensure that Spencer's modest but important contribution to US art was not forgotten. Highly regarded by both colleagues and critics, Spencer's classical industrial landscapes, understated and remote, combined with his personal reticence, did not further his popular reputation or make his work more accessible to the public. He attempted occasional portraits, but apart from some notable still lifes, modernistic views of the landscape were his primary and most successful expressive vehicle. Unconcerned about artistic convention, the quiet contemplative mood of Spencer's work cannot be separated from the spirit in which it was created. — The Watch Factory (1950, 71x107cm) _ This important late work, produced at the peak of Spencer's artistic maturity, is dominated by disciplined organization and an integrated compositional arrangement illustrating the artist's idiomatic approach: austere, controlled, intellectualized, and remote. The abstracted sense of space in this work presents one of his least representational subjects and was singled out by artist-critic Fairfield Porter in a review of the 1952 Downtown Gallery exhibition.1 Spencer's late works are contrived abstractions of architectural space, relying less on literal reality. Articulating the philosophy behind his work, he stated in 1941 that "the deeper meanings of nature can only be captured in painting through disciplined form and design. The visual recognizability is actually irrelevant. It may be there or not." Deliberate in his working method, using studies and preparatory drawings to work out tonal relationships and formal arrangements of delicately balanced compositions, Spencer produced at least two works related to The Watch Factory: Factory, Sag Harbor (1950) and The Watch Factory No. 2 (1950). The subject of these works is a factory in Sag Harbor, Long Island, where Spencer purchased property and spent time beginning in 1948. 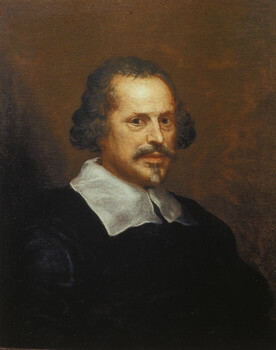 Titles and dates in his work are often subject to dispute, with sequences and chronologies uncertain. Though The Watch Factory No. 2 is titled as the second version, it would appear to be an earlier work. Subtle variations between the two versions are perceptible, the changes providing clarity, depth, and definition of spatial ambiguity in the larger finished painting. The tonal modulation in The Watch Factory is more subdued, and the tightened spatial configuration produces a more resolved composition. The artist has toned and lightened some areas to bring forth details and make other areas recede, as well as altering shadows, alignment of angles, and placement of windows. ^ Died on 16 May 1892: John Banvard, born on 15 November 1815, who painted one of the world's largest paintings, possibly the very largest.  Banvard was educated at the New York high school, and at an early age showed decided talent for drawing and for writing verses. When he was fifteen years old his father lost a large sum of money. John then went to Louisville, Kentucky, and, after some experience as clerk in a drug-store, led a life of adventure, supporting himself by painting pictures and exhibiting them at New Orleans, Natchez, Cincinnati, and other towns, traveling from place to place in a boat. At one time he executed a panorama of Venice. and exhibited it with success. Finally the idea occurred to him to paint a panorama of the entire Mississippi river. He began this task in 1840, traveling thousands of kilometers alone in an open skiff, living on what game he could shoot, and earning money to buy drawing materials by painting and exhibiting pictures. When he had made the preliminary drawings they were transferred to canvas in a building erected for the purpose in Louisville, Kentucky. When finished, the panorama covered 370 meters, though it was advertised and became known as the "three-mile picture" [4828 meters]. He afterward exhibited it in the US and abroad. The artistic merits of the painting were not great, but it was a faithful picture of the Mississippi, and as such attracted a great deal of attention. Later Banvard traveled extensively in Europe, Asia, and Africa, and painted many pictures, which he exhibited. During the Civil War Banvard pointed out to General Fremont how Island No. 10 could be passed by a canal and certain bayous, and made charts showing the route. These suggestions were successfully followed out by Fremont's successor. Banvard is the author of about 1700 poems. He has also published Description of the Mississippi River (1849); Pilgrimage to the Holy Land (1852) ; Amasis, or the Last of the Pharaohs (1864) ; The Private Life of a King (1876); The Tradition of the Temple, (1883). He has also written several dramas, two of which have been acted: Amasis in 1864, and Carrinia in 1875. Banvard painted the picture from which the first chromo made in the US was taken. It was entitled The Orison (1861). — Portrait of Banvard after Charles Baugniet [1814-1886]. ^ >1883 Ferdinand de Braekeleer, Belgian painter born on 12 February 1792. Ferdinand de Braekeleer the Elder was a history and genre painter, whose influence in Belgium was particularly important during the years following the Belgian revolution of 1830. Witness to many historical events and military campaigns, de Braekeleer painted many documentary studies of the bombardment of Antwerp in 1832. In his early years he distinguished himself at the Salon of 1813, and in 1819 won the Prix de Rome, which enabled him to further his studies in Italy from 1818-1822.  Relative? of Henri De Braekeleer [1840-1888]? _ Le Chapeau de Paille (1625; 79x55cm) by Rubens [28 Jun 1577 – 30 May 1640] whose sitter was Susanna Lunden [1599-1643], whose sister, Helene Fourment, Rubens would marry as his second wife in 1630 (it is NOT a straw hat). 1862 Jan-Baptist van der Hulst, Belgian artist born on 22 March 1790. 1849 Firmin Massot, Swiss painter, draftsman, and teacher, born (main coverage) on 05 May 1766. ^ 1749 Peter Casteels, Flemish artist born on 03 October 1684. Brother-in-law of Peter Tillemans [1684 � 05 Dec 1734], with whom he went to England in 1708 to work for a picture dealer named Turner as copyists of Old Master paintings. �- Fruit (900x741pix, 181kb) not appetizing and not identifiable as a fruit of any known species, if anything it looks somewhat like a very rotten cabbage. _ Fossil Fish Race's Photo Finish aka La Sal (2006; screen filling, 281kb _ ZOOM to 1864x2636pix, 1778kb). _ Verticals After Diet Ales Are Gone aka Diary Raid (2006; screen filling, 266kb _ ZOOM to 1864x2636pix, 1884kb). ^ 1755 Johann Georg Sch�tz “R�mer-Sch�tz”, German artist who died on 11 May 1813, brother of Franz Sch�tz [16 Dec 1751– 14 May 1781]. Johann Georg Sch�tz wird am 16. Mai 1755 als zweiter Sohn des Christian Georg Sch�tz I "dem �lteren" [24 Sep 1718 – 03 Dec 1791] und seiner Ehefrau Anna Maria in Frankfurt am Main geboren und am 19. Mai in der Frankfurter Kirche St. Bartholom�us getauft. Johann Georg wird zun�chst von seinem Vater unterrichtet. Von 1776 bis 1779 studiert er auf der Malerakademie in D�sseldorf, verweilt dann l�ngere Zeit bei seinem Vater in Frankfurt und reist 1784 nach Rom, wo er die n�chsten sechs Jahre lebt und arbeitet. Nach diesem Aufenthalt erh�lt er den Beinamen "R�mer-Sch�tz". Er wohnt in Wilhelm Tischbeins Haus an der Via del Corso. 1786 st��t auch Johann Wolfgang Goethe zu diesem Kreis und nimmt dort Wohnung. Goethe �bt auf Sch�tz einen m�chtigen Einflu� aus. Sch�tz� Verdienste sind allgemein anerkannt und werden auch von Goethe sp�ter in dem Werk "Winkelmann und sein Jahrhundert" gew�rdigt. Einen weiteren G�nner findet Sch�tz in dem Sohn der Dichterin Sophi La Roche, dem Oheim der Bettina von Arnim. Er nimmt Sch�tz 1790 mit sich in die Heimat zur�ck, r�umt dem Maler in seinem Haus in Offenbach am Main mehrere Zimmer ein und f�rdert durch Gew�hrung einer gesicherten Lage die unbeengte Aus�bung seiner Kunst als Radierer und Historienmaler. Sch�tz mal vorwiegend historische Gegenst�nde, Genrest�cke, aber auch Portraits und Landschaften. Am 21 October 1798 heiratet Johann Georg Sch�tz in Fl�rsheim Maria Thekla W�rdtwein aus Walld�rn (Baden), die Schwester des Fl�rsheimer Pfarrers. F�nf Jahre sp�ter, am 16. April 1803 wird ihm in Frankfurt der einzige Sohn geboren, Christian Georg III. "der J�ngere". Der Sohn, der als Maler ein vielversprechendes Talent zu werden verspricht, stirbt 13 May 1821 bereits im Alter von 18 Jahren an der Schwindsucht. Wie sein Sohn und sein Bruder Franz erliegt auch Johann Georg Sch�tz der Schwindsucht und stirbt am 11 May 1813 in Frankfurt am Main.